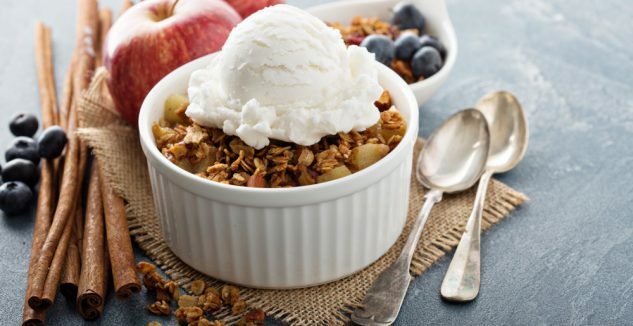 We love serving apple crisp at our Community Dinners, particularly in the fall months! Fruit crisps are super easy and delicious desserts—and you can substitute cherries, pears, peaches, plums or pretty much any other fruit you’ve got in this recipe. This recipe comes to us from the Pennsylvania Nutrition Education Program and the USDA. Find more delicious, nutritious, and cost-efficient recipes here. Grease the bottom and sides of a square pan. Spread the sliced apples on the bottom of the pan. Cut the butter into small pieces and put in a medium-sized bowl. Add the oatmeal, flour, brown sugar and cinnamon. Using two knives, cut the butter into the mixture until it looks like small crumbs. Sprinkle the mixture over the top of the apples. Bake for about 20 minutes. Serve hot (with ice cream, if you have some! ).